Speaker: March 17, 2010, "Climbing in the Dolomites"
Speaker: March 18, 2009, "Climbing at Red Rock Canyon National Conservation Area"
Speaker: June 18, 2008, "Mountaineering in the Indian Himalaya"
Jason Halladay of Los Alamos, New Mexico, has been mountain climbing for over half his life. His addiction to the outdoors and mountain climbing began in his teenage years as simple backpacking trips but has evolved into technical rock, snow and ice climbs of more difficult and demanding peaks. Halladay honed his alpine climbing skills while climbing all of Colorado’s 59 14ers not once but twice in the past 9 years in all seasons of the year. While most prefer climbing the mountains of Colorado in the summer months, Halladay enjoys the “off seasons” relishing in the cold temperatures and long approaches. Many of these 14er climbs have been with his long time friend and climbing partner, Aron Ralston. Halladay and Ralston share a similar climbing style and ethic and enjoy pushing themselves in the outdoors. In the winter and spring months, Halladay loves climbing the peaks of Northern New Mexico and Colorado in search of backcountry snowboarding descents. As a previous competitor for many years of USASA (United States of America Snowboard Association) freestyle competitions, backcountry snowboarding is one of Halladay’s strongest abilities. 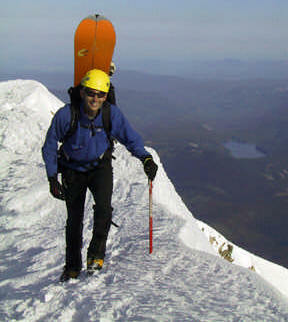 “I feel the most comfortable when I’m climbing or descending steep snow,” says Halladay. Jason about to take the plunge! Halladay has lead successful expeditions to four of the “Seven Summits”-- Denali (20,320’, Alaska, USA), Kilimanjaro (19,340’, Tanzania, Africa), Aconcagua (22,841’, Argentina, South America) and Mount Kosciusko (7,310', Australia). His comfort on snow climbs has equated to a number of successful climbs of some of the United State’s highest summits including the West Buttress of Denali and Liberty Ridge of Mount Rainier and a snowboard descent of Mount Hood’s south face. Not one to concentrate too much on one particular discipline, Halladay is an accomplished rock climber as well. While he leads 5.11 sport routes, his greatest rock climbing enjoyment comes from alpine traditional routes in the 5.7 to 5.10 range. His alpine rock climbing skills have taken him to the summits of Wyoming’s Grand Teton and Devils Tower as well as many great climbs in the Wind River Range of Wyoming, Red Rocks (Nevada), Rocky Mountain National Park (Colorado) and the Sierra Nevada Mountains of California. 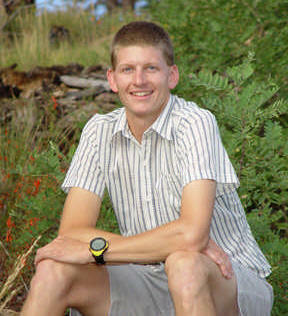 He's also taken to ultrarunning in recent years and has completed numerous 50 mile and 100 mile trail races. Visit Jason's website by clicking here. Halladay’s undergraduate degree is in the field of broadcast journalism so he’s quite comfortable both behind and in front of the camera. He is an avid photographer and enjoys documenting his climbs with his digital cameras. Halladay currently works as a computer technician at Los Alamos National Laboratory.